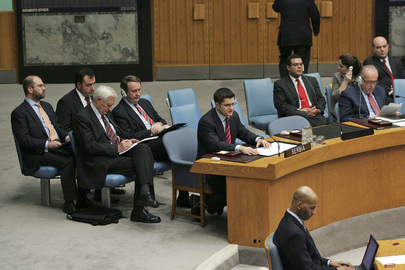 UNITED NATIONS, August 30 -- When the UN Security Council belatedly met Tuesday about Kosovo and the July 25 events on its border with Serbia, it was known in advance that a divided Council would have no outcome. "I'm going to make a strong statement," Russian Ambassador Vitaly Churkin told Inner City Press outside the Council. A spokesperson for Serbia later added, "Since they blocked the draft Presidential Statement, why not?" When his turn came, Churkin said that the UN Mission in Kosovo, UNMIK, is suffering a lack of leadership; he wondered why Secretary General Ban Ki-moon has not moved to name a new Special Representative after Lamberto Zannier left to head the OSCE. Inner City Press went to Tuesday UN noon briefing and asked departing deputy spokesman Farhan Haq about the delay, and to respond to Churkin's critique. Haq merely said that the acting UNMIK chief was in the Council, and that the process to replace Zannier is underway. But it was a long time ago, that Inner City Press was asking the UN about Zannier applying to head OSCE. How or why could the UN Secretariat be so unprepared? Or is it -- Ban Ki-moon's UN Secretariat -- taking sides? After the meeting, Inner City Press asked Serbian foreign minister Vuk Jeremic who many votes he thought he had for the Presidential Statement, beyond the seven he'd previously listed. He said it only takes one member to block the statement. Jeremic said that EULEX has no jurisdiction outside of Kosovo. Moments later his Kosovo counterpart disagreed, telling Inner City Press that EULEX has many members, listing Albania as the example. But what if the organs went to the Middle East, in particular the Gulf? Inner City Press asked if the UN had blocked Kosovo from entering the premises when the border incident first came up, on the theory that the Kosovo delegation did not have a meeting in the UN. This was dealt with diplomatically, along with a "public call" that the UN treat Kosovo better. The stakeouts degenerated into questions about Serbian criminal groups, the Scorpions, and the upcoming Palestine vote -- Kosovo still speaks only about its own destiny, not that of other states. And so it goes at the UN.